A British artist living in West Cork, Ireland. Self taught in a multitude of disciplines, Nigel Connell Bass is well known for his sculpture work in recycled metals, predominantly life-size depictions of birds and animals. He worked for 10 years, as a scenic artist for a busy Theatre production company, before moving with a young family to Ireland in 1996. Bringing up a young family after the move to Ireland, and completing a self-build house, meant that for a few years, art took a backseat role as he worked mainly painting, decorating and sign-writing to make a regular living wage. In 2015 Nigel returned to art full-time. 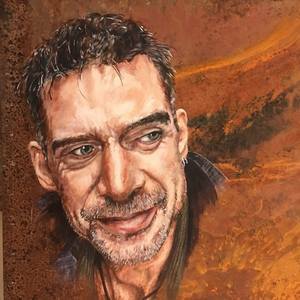 He is enjoying success regularly exhibiting his sculpture work at prestigious venues throughout Ireland and continues to explore new concepts in sculpture and also painting in acrylics onto rusted metal sheets.